The GTAP Africa 2 Data Base includes data for 42 regions (32 African regions plus 10 other aggregated regions) and the 57 sectors of the GTAP 8.1 Data Base. New and updated I-O tables have been contributed with the help of African economists who were awarded scholarships to contribute this data and pursue research on African economic issues. The GTAP Africa 2 Data Base is packaged with the GTAPAgg aggregation software which is freely available for download after placing an order on the GTAP website. The GTAP Africa 1 Data Base includes data for 39 regions (30 African regions and 9 other aggregated regions) and the 57 sectors of the GTAP 6 Data Base. Cameroon, Cote d'Ivoire, the Democratic Republic of Congo, Ethiopia, Ghana, Kenya and Sudan are the new I-O tables that have been contributed by African economists who were awarded scholarships to contribute this data and pursue research on African economic issues. The Global Trade Analysis Project (GTAP) is a global network of researchers and policy makers conducting quantitative analysis of international policy issues. GTAP is coordinated by the Center for Global Trade Analysis in Purdue University's Department of Agricultural Economics. Nominations are now being accepted from GTAP Network members who, in the past five years, have contributed to the GTAP Data Base, and/or presented a paper at the annual conference. If you fit this criteria and are aware of anyone who has made significant contributions in the areas detailed above, we encourage you to nominate them for consideration for the 2019-2022 GTAP Research Fellow term. *GTAP Staff, GTAP Advisory Board Representatives, current GTAP Research Fellows and GTAP Research Fellow Hall of Fame inductees are not eligible for nomination. "Introduction to Computable General Equilibrium Modeling"
The objective of GTAP 101 is to engage participants in an active, team-based process of learning about the GTAP CGE model and its use in applied economic policy analysis. The curriculum is geared to advanced undergraduates, graduates and professionals. Following the course, participants will be entry-level modelers and more informed consumers of CGE-based analyses. "Applied Policy Analysis with Advanced Trade Theories"
conduct trade policy experiments and interpret simulation results using the GTAP-HET Model in team-based research projects. "Applied Policy Analysis: Course on Preferential Trade Agreements"
The GTAP PTA Course is designed to provide professionals and students with hands-on, applied training in the analysis of preferential trade agreements (PTAs) using the GTAP computable general equilibrium model. The objectives of the GTAP PTA course are to provide students with an underpinning in the economic theory of tariffs and customs unions and regulatory policy analysis, and to help them develop their applied skills in database development, design of PTA experiments and analysis of model results. The Center for Global Trade Analysis is pleased to announce the latest issue of the Journal of Global Economic Analysis has been released. All articles are open access and include supplementary files that allow for replication of results. Authors interested in submitting their work to the this publication are invited to read the Journal's Focus and Scope and Author Guidelines. "Challenges to Global, Social, and Economic Growth"
The goal of the conference is to promote the exchange of ideas among economists conducting quantitative analysis of global economic issues. Particular emphasis will be placed on applied general equilibrium methods, data, and application. Related theoretical and applied work is also welcome. "Introduction to Applied General Equilibrium Analysis in a Multi-Region Framework"
The short course consists of two parts. The online phase is an eight-week sequence where students get in-depth training about the microeconomic underpinnings of applied general equilibrium (AGE) models. The online course allows for self-paced learning on a modular basis. Each weekly module requires an end of week submission that triggers feedback from the instruction team. The onsite course is a mix of lecture and lab sessions designed to develop the economic intuition required to perform high-level policy analysis using the GTAP Model and Data Base. These activities culminate in a major application undertaken by small groups and presented on the final day of the course. 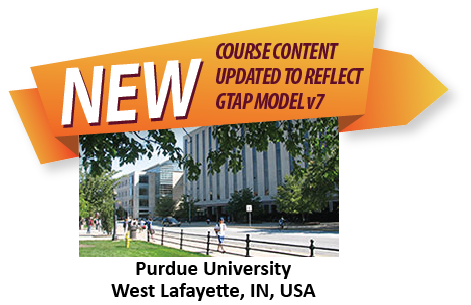 This quick reference teaching and training aide highlights major model and code changes incorporated in the GTAP Model v7. Organizations interested in posting an announcement below and on the GTAP-L Mailing List should email complete details, including contact information and closing dates, to contactgtap@purdue.edu. My recent research using GTAP deals with the effects of regional integration in both members and non-members countries, with emphasis on international trade and welfare. The simulations involve the reduction of both tariffs and NTBs using GTAP's precious bilateral trade information, focusing especially in Brazil's future trade agreements with trade partners such as European Union and BRICS. I am using the GTAP 9 Data Base to evaluate the economic and water resource scarcity effects of trade liberalization and facilitation in the Nile basin. Besides, I am using the data in assessing the economy-wide impacts of climate change and irrigation development in the basin. In both cases I am applying the GTAP-W model. My research examines issue-linked environmental policy cooperation and market structure. I am currently using the GTAP Data Base to explore the implications of combining second best emission taxes on intermediate inputs with positive trade concessions under imperfect competition. The GTAP Data Base constitutes an invaluable and integral part of my research activities, which at the current time, have a European Union (EU) focus. With the data enhancements to the EU domestic agricultural support component, I use it to conduct impact assessments relating to Common Agricultural Policy reform scenarios, or different trading arrangements (in concert with other researchers, I am currently looking at different trading futures between the Commonwealth of Independant States and the EU). In addition, using ongoing work at LEI Wageningen to split out additional sources of biomass supply and use from GTAP data sector and commodity classifications, the data provides a basis for examining the potential for sustainable biobased growth strategies in the EU. I am using the GTAP 9 Data Base (and associated packages) in two main areas of research. The first investigates the impacts of trade policies at the regional, national and household levels for selected countries in the Asia-Pacific region. The second line of enquiry is the analysis of land-based carbon mitigation options to address climate change. My research mainly focuses on Multiplier (Leontief) models, real CGE models and Balance Sheet-CGE models, all of them based on the System of National Accounts of Venezuela. Currently I am working on a structural-comparative analysis of the Venezuelan economy based on the GTAP data versions 8 and 9. Also, I am conducting studies regarding sectoral and macroeconomic effects of domestic and foreign shocks that affect the Venezuelan economy. I am representing State scientific research institute of informatization and economic modelling (http://dndiime.org.ua/). Our main themes of research are Ukrainian trade policy development with different trade partners in the World trade, evaluation of trade limits over forestry sector in Ukraine and its economic influence, rising trade tariffs over metal scrap, implementation of the temporary (during one year) import tariffs 5-10% depending on the sector legalized by Ukrainian law. Also, the Institute created laboratory of economic analysis and trained the team of experts. During 2015–2016 years 8 projects were done. Preparations for an in-depth study of the impact on the conclusion of free trade agreements with Canada, Turkey and Israel on the economic development of Ukraine are continuing. 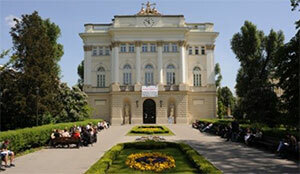 Researches are carried out on the orders of state authorities and business structures. Dr. Aydin's recent two works focus on contemporary issues in potential economic and environmental impacts of; 1) economic integration on BRICS economies, and 2) political economy of diesel subsidy on Turkish economy by using computable general equilibrium models namely, GTAP/GTAP-E and ORANI models. The data used in these works are derived from the GTAP 9 Data Base well-suited to examine the consequences of trade opening and energy-carbon abatement policy issues. In his works, structure of these models has been modified in a number of ways to make it suitable for analyzing energy and environmental issues. I am using GTAP data (GTAP-E and GTAP-Power) to analyze the general equilibrium effects of unilateral environmental regulations and trade. The main focus of my research is to analyze the overall welfare effects under different emissions regulatory frameworks, such as cap and trade regulation and emissions per output regulation. There is a special emphasis on the implications of embedded carbon dioxide on trade of goods. My current research is on the effect of China-Australia FTA on China-New Zealand trade. Australia and New Zealand has rather similar endowments, so this had put the two countries in an interesting position. It is interesting to see the various effects of expanding from a bi-lateral free trade zone of China and New Zealand Expanding to a Tri-lateral free trade zone of China, New Zealand and Australia. I have used the GTAP Data Base (along with other supplementary ones) for my research works since my PhD days. I am a regular subscriber of the GTAP Data Base and satellite programs as well. My area of research is related to globalization, trade, and economic development. For exploring multi-faceted issues related to global trade and development GTAP Data Base is excellent resource to use and the current version 9 is expanded to include more aspects. Over the years, the expanded versions of GTAP has benefited me for exploring issues such as technology transfer, skilled-unskilled wage gap, trade integration, and allied topics. Right now, I will use GTAP 9 for studying issues related to firm heterogeneity, mega trade deals which is my current research interests. Also, I published a book in 2014 which included contributions from reputed CGE scholars using GTAP and other CGE models like MONASH or USAGE. No doubt, GTAP 9 and other databases are useful research materials for state-of-the art areas. John and his colleagues at NZIER are using the GTAP 9 Data Base primarily for evaluating the potential effects of New Zealand's current and proposed Free Trade Agreements, such as TPP and the EU-NZ FTA. They are also linking the GTAP Model with their more detailed single-country CGE model of the New Zealand economy - ORANI-G-NZ - to assess the impacts of trade liberalisation at a more detailed industry and sectoral level. The use of GTAP in my research program has been fitting these data to endogenous saving – multi sector growth models. Most recent applications deal with: economic growth and ground water dynamics in the Punjab of India, strengthening ecosystem and development linkages in the Republic of Kazakhstan, the conjunctive use of irrigation water over time in Morocco, land market integration and structural change in Zambia, a journal paper on international trade, exhaustible resource abundance and economic growth, and a thesis on the effect of transnational farmland investments over time on the Ghanaian economy. The data were also used in the book: Multisector Growth Models: Theory and Application, Springer pub. 2010. Additionally, the data is also used in my MS and Ph.D. level classes. I am using the GTAP 9 Data Base for developing a CGE model for analyzing climate change issues. I use the data base, but develop my own dynamic CGE model. One of my recent interests is to link climate science and climate economic studies. I began to learning the GTAP Model in 2002 and used it intensively afterward. More than 50 academic research papers and reports had been published up to now by adopting standard or improved GTAP Model. Meanwhile, I have developed China's agricultural partial equilibrium model and have been trying to develop China's dynamic national and regional (provincial level) CGE models. My job is to analyze the modern and potential trade policies and provide policy facts and suggestions to government. Parts of my responsibilities are quantifying the impact of trade policy on the economy based some quantifying and empirical instruments, for example GTAP Model and other general or partial equilibrium models as well as some econometrical models. GTAP 9 Data Base is the most comprehensive database including enough economies and sectors, being the strong backing for lots of our analysis. I am interested in trade analysis worldwide and more specifically in Eastern Europe (Ukraine, Russia, and the EU) and Central American countries. Furthermore such issues as tariff and non-tariff barriers to trade on agricultural goods and its modeling are in scope of my interest. Lastly, tax-subsidy policies and its modeling in GTAP frame (as an example EU Common Agricultural Policy). I have been using the GTAP 9 Data Base to better understand the interplay between Preferential Trade Agreements and the formation of Global/Regional Value Chains, taking into account the role of non tariff barriers such as TBT, SPS and trade facilitation. This is, nowadays, a crucial issue for less integrated economies such as Brazil. Uses the GTAP framework to implement and simulate CGE models for applied energy-environmental policy analysis. Static and dynamic CGE models are used to assess the impacts of U.S. biofuel policy on land use change, greenhouse gases emission, and the economy. Others applications include dynamic evaluations of the comparative implications of demand vs. supply shocks on global and regional economies. I am interested in modeling renewable energy adoption in Saudi Arabia. My plans to use a combination of GTAP modeling and life cycle assessment (LCA). The LCA's analysis will be extended to include changes in economy and technology through using the Computable general equilibrium (CGE) in GTAP framework in order to include the indirect environmental consequences caused by the RE adoption. The GTAP Model and Data Base has been used by our GEMTEE(General Equilibrium Model for Taiwan Economy and Environment) team in Academia Sinica to investigate the macroeconomic and sectoral impacts of Taiwan's population dynamics and policies related to sustainable development and free trade agreements with New Zealand, Singapore and China. Recently, policy debates upon whether Taiwan should join TPP and RCEP are mostly based on GTAP simulations. I am engaged in the Chinese grain supply and demand analysis trying to establish a partial equlibrium model using lots of unique data. GTAP is a very effective and important tool kit to support this global analysis. Richard Wood works with the GTAP Data Base in analysing environmental impacts associated with trade and final demand. Taking a "consumption based" approach, Richard looks at the interconnection between development, trade and the environment, in order to determine underlying drivers of our impacts. Richard is involved in database development of multi-regional input-output (MRIO) models, and in this context uses the GTAP Data Base alongside other MRIO databases to understand robustness and variability across the databases (see www.environmentalfootprints.org). The topic of my Ph.D. dissertation is the evaluation of proposed Regional Comprehensive Economic Partnership (RCEP) agreement between 16 Asia-Pacific countries using general equilibrium framework. For this purpose, I am using the Static GTAP Model and the GTAP 9 Data Base is the only database which provides the latest, detailed and consistent data to estimate it. The main objective of my research is to evaluate the impact of reduction in trade barriers due to RCEP agreement on economies of member and non-member countries. The usage of the GTAP Model with the GTAP 9 Data Base allows me to report the direct and indirect effects of reducing trade barriers in a post-simulation environment. I have studied the impacts of trade policy and climate change policy by using the GTAP Data Base and Model under several research projects. In particular, I am interested in the structural change caused by the policy and analyzing it by combining a CGE approach with an input-output approach. I intend to use the GTAP 9 Data Base and GDyn-E Model to investigate the economic and environmental effects of East Asian emission trading in the context of China's 2030 carbon peak out. Pantelis CAPROS is Professor of Energy Economics at NTUA (National Technical University of Athens). Over 25 years, he is leading research based on large-scale numerical models, which simulate energy markets, project energy investment into the future, optimize roadmaps for climate change mitigation and assess economic and societal impacts. He is the Director of E3MLab, a laboratory operating within the NTUA that specializes in the construction and use of large scale computerized models covering the areas of Energy, the Economy and the Environment. Such models are used to make projections and analyze complex issues requiring system-wide consideration. The European Commission, Governments, electricity and gas companies, and their associations, are widely using these models, namely PRIMES and GEM-E3, in their policy analysis, continuously over the last 20 years. Electricity and Gas market design, long-term energy/environment planning and macroeconomic analysis are the main topics of Prof. Capros's consultancy activities. Mathematical programming, mathematical economics and energy analysis are the scientific disciplines of Prof. Capros's teaching and publishing activities. For me, the GTAP 9 Data Base is an essential source of data for a number of different lines of research on trade policy and regional integration. Our work at CEFIR is particularly focused on the countries of the Eurasian Economic Union (EAEU): Armenia, Belarus, Kazakhstan, Kyrgyzstan and Russia. The GTAP 9 Data Base is unique since it contains social accounting matrices for all five EAEU countries. This is why the GTAP 9 Data Base is the cornerstone of most CGE-type analysis produced by CEFIR, for example, a recent assessment of reduction of non-tariff barriers in the EAEU. We also use GTAP 9 as a source of input-output tables for assessment of trade in value-added and estimation of effective rates of protection for the EAEU countries. I am using the GTAP framework to assess the systemic effects of increased economic relations between Brazil and the countries of the America Continent. To this end, we build scenarios such as: a) the formation of a new Free Trade Area of the Americas, namely, the elimination of import tariffs and export subsidies and production among the members; b) assessment of agreements such as the Pacific Alliance and Mercosur; and c) evaluation of NAFTA agreements - Mercosur, among others. We expected to bring answers on the trade integration of the Brazilian economy with other American countries.